Hopefully everyone is having a good day? I wash my hair every other day and alternate between shampoos & conditioners. For example: Monday- Wash and condition with shampoo A.
Wednesday: Wash and Condition with Shampoo B.
I don't use a blow dryer very often and when I do I try to use it on cool. I also don't use heat on my hair every day, but I do every now and then and use my TRESemme Heat Tamer Spray. However, since I don't use it EVERY day I didn't include it. So I'm going to talk about the products I use and how they affect my hair. (For this post I'm going to use online images and information. "The formula, containing Color-Correcting Technology, neutralizes brassy and yellow tones. The formula, containing Optical Brightening Technology, absorbs UV light and emits white-blue light, making color-treated hair appear brighter and salon-fresh. Results are noticeable after just 3 uses. 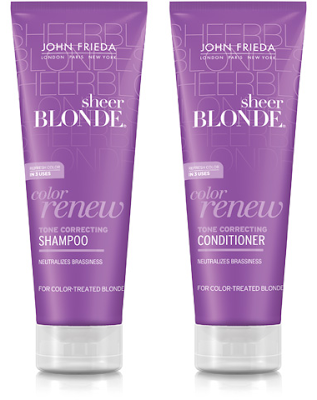 For all shades of color-treated or highlighted blonde hair"
When I use this set of shampoo and conditioner, I notice that my hair feels "fuller". I have fine thin hair, it's not super thin but it's definitely not thick. I have natural blonde hair with blonde highlights and I've noticed this has made my hair look brighter. It says it neutralizes brassiness, which I don't really think I had any "brassy" look to my hair but it has help tone it up some and I really like the smell. It has kind of like a "salon" smell to it. 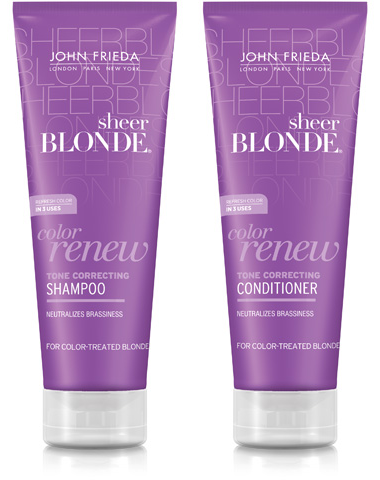 "Gradually lightens blonde hair for a year-round sun-kissed look. 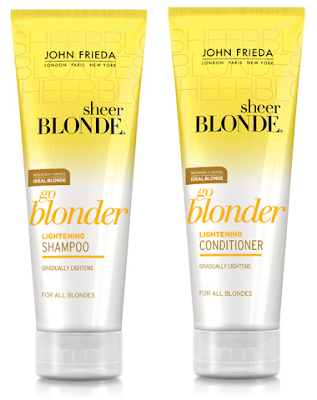 The formula, containing a natural Lightening Complex, gently reduces the color pigments in the hair. Gentle enough for daily use. Ammonia and peroxide-free. 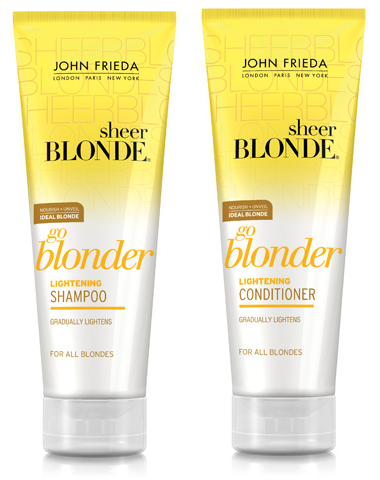 For all shades of natural, color-treated or highlighted blonde hair"
It's funny, when I use this set my hair feels so soft but it feels thinner. I'm not sure what it is, or if it just feels thinner as opposed to how it feels after I use the tone correcting. It definitely feels very soft and silky, which can actually be a pain when it comes to styling my hair. I naturally have pretty soft hair but it tends to get tangled very easily, but I've noticed a big decrease in tangled and knots since I've started with these. When it comes to lightening my hair, I can't really tell because it is supposed to be subtle and I'm not using it everyday so I'm sure I'm not getting maximum results either. This also has the same salon-like smell to it that I like. 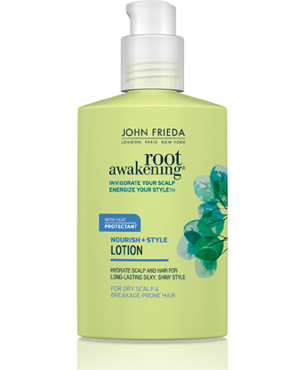 "Lightweight formula, with Eucalyptus and Peppermint Extract, smoothes hair without weighing it down for silky, shiny style." I was worried when I first tried this because it smelled kind of minty. However, the smell didn't really linger in my hair or anything, and when it dried on my hands it didn't feel greasy or sticky or anything like that. It felt very smooth and nice, which made me happy. I notice when I don't use this, my hair isn't as manageable and it has less volume. My hair isn't really voluminous so when I lose volume from the little I have it's disappointing so I always try to make it a habit to put 2-3 pumps and work it through my hair. I definitely love this product. but nothing major where my hair never sheds at all. And that pretty much concludes my hair care routine. Now for a sweet treat! It looks so good, right? I haven't had a piece yet but from the way it looks and smells, it's going to be delicious. I wish I could share it with you all! omg that cake looks absolutely delish!!! I also tagged you with those three tags I have on my blog since I didn't tag anyone and I would love to read your responses!! Yeah, it was hard for me since my hair gets oily pretty fast but it's not too bad with only one day of not washing, but if I go more than that it gets too much for me. & I can't wait to eat the cake! I have been trying so hard to only wash my hair every other day, but like Traci, I can't do it either! I feel so itchy! When I saw the picture of the cake, I was like,"No...she doesn't put chocolate on her hair does she??" It really does look delicious! I can make myself SICK on chocolate cake! Aww, well I suppose it is easier when I pretty much lounge around my house all day, since before when I used to go places a lot I'd have to wash my hair everyday. LOL. Oh gosh.. that made my night. Rest assured I don't put cake in my hair, but it is oh-so-delicious in my mouth.